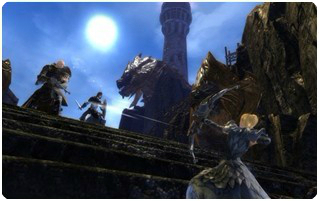 ArenaNet announced a second stress test for Guild Wars 2 on Jun 27th. It has been two weeks passed since the last beta weekend. Players who have pre-purchased Guild Wars 2 now have another 4 hours to play the game. Since we are expecting a better and more fluent gameplay in its final released version, which mainly refers to the bugs in PvP system, here we will talk about the huge server vs. server combat system: World vs. World. Guild Wars 2's World vs. World PvP is one of the keys that makes it different from the majority of modern MMOs. In second beta weekend of the game, we've experienced the World vs. World PVP again. The gameplay in this large PvP combat area brings players the most fantastic experience, I guess. So how did this WvW successfully draw attentions of players? There are several reasons that may affect. Firstly, it's really a battle field of thousands of fighters and killers. You need to always look around your shoulder or watch over the trees to see if dangers are coming, even if you are companioned by many allies or even there are not lots of players fighting. ArenaNet set this special area in Guild Wars 2, which is something lost in many other game systems. We can see that in some of them you always know what you are facing or will get. While in GW2's World vs. World, you could come trough anything at any time. You and your group could face 3 opponents or 30. There is no telling of what is coming next. Secondly, you can get to the WvW combat in your User Interface. It's smart to set a quick access for such an important aspect. Within two clicks to get into the PvP really do convenience for players. With World vs. World you don't have to queue for a battleground, you just go right in. If no players are out or about to be out and you have a proper group, it is pure win. You can start attacking objectives to get those rewards for your realm, with a mix of PVE and PVP in the Eternal Battlegrounds. Thirdly, it's a three faction system, which pits three whole servers against each other. Every week, your server will be assigned a color and matched against two others: The green, red and blue. Each team holds at most 300 players to defend its territory and expand into other to rivals' heartland, while a fourth neutral area acts as a key point for the conflict. The key of World vs. World is the three sides, instead of two. This is much more interesting than just two sides' fight, especially because it's never going to be a simple matter of one side overpowering the other. Fourthly, even a level 1 player can enter WvW. You can fight even with only one skill on your weapon bar. Like in Guild Wars, ArenaNet will boost you to the max level, boost your stats, and give you some placeholder gear to start competing right from the start. Sure, real level 80s will know their professions better, and they'll have real gear to fight with, but there's nothing stopping you from partaking. However, just as I mention before, there is problem existed. Potential downsides should be looked at and solved out. 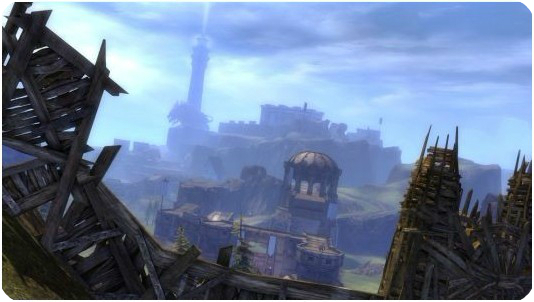 But there is a lot of things in Guild Wars 2 that we have expected and should have look forward to. We will never know how it works out till its final launch and running.